Salem College art professor Dr. John Hutton was once again commissioned to illustrate the holiday card for the White House Historical Association. The 2013 card honors President Woodrow Wilson. A different president is featured each year. The cards retail for $17.95 per box and are available from the White House Historical Association’s website. 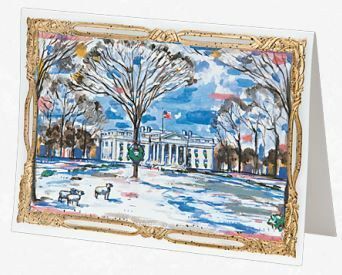 In addition to illustrating holiday cards, Hutton also has contributed several illustrations to a book published by the White House Historical Association that received a 2013 Living Now Gold Award (first prize for children's non-fiction) from the Association of Independent Publishers. The book, Fingerprints on the Table, features Dr. Hutton's drawing of the White House on the cover. Hutton is also author and illustrator of the Sister Maus children’s book series, which is based on colonial life in the Single Sisters House on Salem’s campus. The latest in the series, Flowers for Mr. President, was released earlier this year. The books are available at the Salem Academy and College Bookstore, Old Salem Museums and Gardens gift shop and on the Salem website. The White House Historical Association was established in 1961 as a non-profit organization to enhance the understanding, appreciation and enjoyment of the Executive Mansion; proceeds from the association’s trusts, publications and other items are used to fund acquisitions of historic furnishings and artwork for the permanent White House collection, assist in the preservation of the public rooms, and further its educational mission.